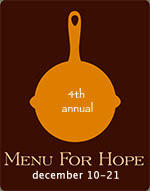 This year, Chocolate in Context is participating in the web-based charity event Menu for Hope. Started in 2004 by Pim Techamuanvivit of Chez Pim, Menu for Hope is a collaboration among food bloggers to raise money for the UN World Food Programme. Last year, the organizers raised over $60,000. Here's how it works: between December 10 and 21, hundred of bloggers like me sell (via the fundraising site firstgiving) $10 raffle tickets for an array of foodie prizes. At the end of the campaign, we select one winner for each prize. The winner of the Chocolate in Context/Mon Aimee Chocolat Prize will receive a selection of ten mini chocolate bars and a $50 gift certificate redeemable for anything in stock at Mon Aimee Chocolat. The Pittsburgh chocolate shop carries a carefully curated collection of Amedei, Domori, Guittard, Pralus, Scharffen Berger, Theo, Valrhona, and Vosges bars that have calmed my cravings since I moved to this steel town. Now owner Amy Rosenfield is offering up her goods and services as part of Menu for Hope. Indulgences on offer include the universally beloved fleur de sel caramels from Fran's Chocolates, seasonal bon bons from Garrison Confections, and the private-label "Les Amis Savories" (sage-, tarragon-, and sea salt-flavored M&M-like candies) made for Mon Aimee Chocolat by Koppers Chocolate. Amy doesn't take online orders, but she'll be happy to attend to you personally over the phone. Whatever you choose, the shipping's on me--even if you live overseas. The Chocolate in Context/Mon Aimee Chocolat Prize Code is UE41. To buy a raffle ticket for this prize only, go directly to firstgiving to buy a raffle ticket, entering 'UE41' in the 'Personal Message' section. To find out more about other prizes on offer, please follow the directions below.